The Top teams from the Online Prelims will be selected for the Onstage finals on 11th December at SCMHRD, Pune by QuizMaster ROHIT NAIR! The Sweden-India Nobel Memorial Quiz 2011 brings together quizzers from esteemed colleges and technical Institutes for an Inter-Collegiate Quiz in a battle where minds prevail over muscles. The winning team gets an all-expenses paid trip to Sweden with special visits to some of the Sweden-India Nobel Memorial Week partner companies, as well as chances for internships with these prestigious companies. The team should consist of three members belonging to the same college. There can be more than one team per college, that means multiple entries are welcome. Individuals are not allowed for the Nobel Quiz. The Nobel Quiz is being conducted in five cities. Dates and other related information is given below. Please mention the college you represent along with the city. The topics for this quiz are based on Alfred Nobel, His Works, Nobel Prize, Nobel Laureates, General knowledge of Sweden, Innovations and Inventions of Sweden and Swedish companies in India. Venue : IEM Auditorium, R.V.College of Engineering, Mysore Road. Symbiosis Institute of Business Management Pune, the flagship institute of Symbiosis society is organizing “B-Quizzed @ SIBM” on 4th of September 2011. SIBM, established in 1978, is the fourth best B-School in India, according to Economic Times Corporate Dossier. 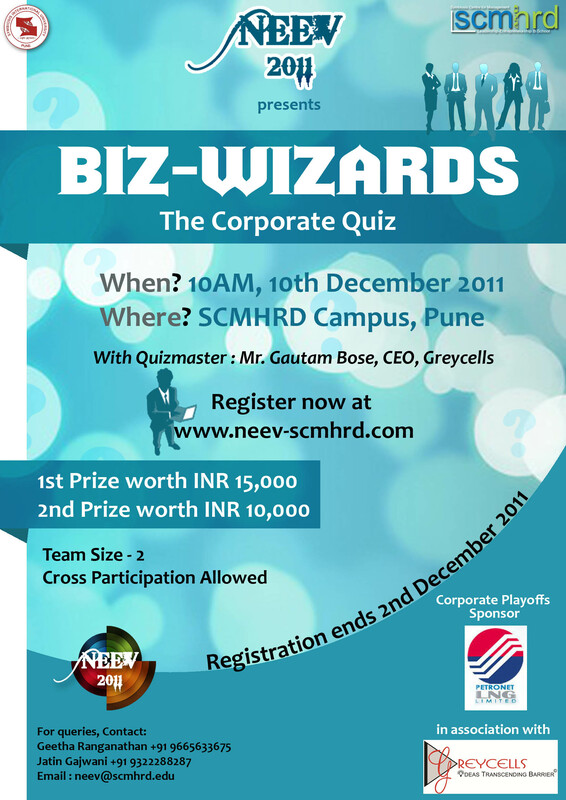 B-Quizzed @SIBM is the first of its kind quiz for MBA aspirants. Last year we had the quiz only for undergraduate students, but this year, we are opening it to both corporate and undergraduate participants. Stage 1: An online preliminary quiz will be hosted on our website between 9:30pm to 10:30pm on the following days. The participants should attempt a minimum of one of these quizzes to qualify for the finals. 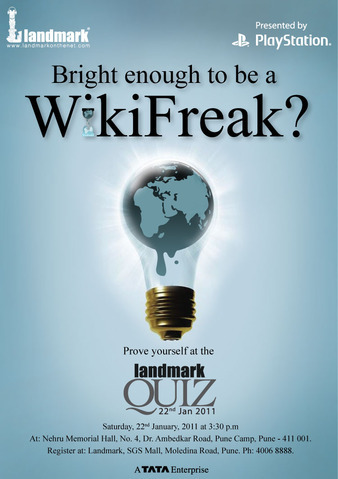 The results of this quiz will be announced on 25th August 2011. Stage 2: The second stage will consist of the Pune regional round. The round will happen on 4th September 2011. The winner and runner up of the Pune round will qualify into the national finals. Stage 3: The third stage will consist of the National Finals. Stage 3 will happen on 4th September 2011, right after the Pune regional round. 6 teams from the online round will qualify for the national finals, along with 2 from stage 2. 3 participants in a team. All 3 should represent one institution, i.e. All 3 should represent the same college, MBA prep class or company. College participation limited to undergraduate colleges only. The team has to log on to http://sibmpune.edu.in/iaspire to take part in the quiz. At least one entry is required to validate participation. The event runs for 5 days: 15th, 17th, 19th, 21st, 23rd August 2011, with the top 6 teams from the online prelims qualifying for the National Finals on 4th September 2011. Any number of teams from an institution can take part. 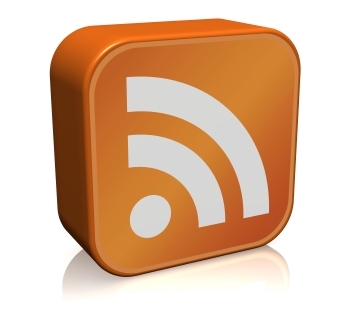 If you are preparing for this Quiz, you must read this! A 24 city Tata Crucible this year to reach out to a far greater student audience!! . Most new locations seem to be cities that have new IIMs/IITs . This is a great initiative by Tata Crucible to take Business Quizzing to the masses. Have a look at the dates below. Updates questions and results as and when they happen. Special Prizes worth Rs. 3,000/- for the Audience, Best Team Name, etc. The Great Minds Tech Quiz is India’s first National Level Tech Quiz for Engineering & MCA students. The Quiz will be hosted in 4 locations – Pune, Bhubaneshwar, Chennai and Bangalore. The quiz series will culminate with a National Final in Bangalore later in the year. As a precursor to The Great Minds Tech Quiz, Quizzing.in brings to all Engineering & MCA students two online quizzes with fabulous prizes. 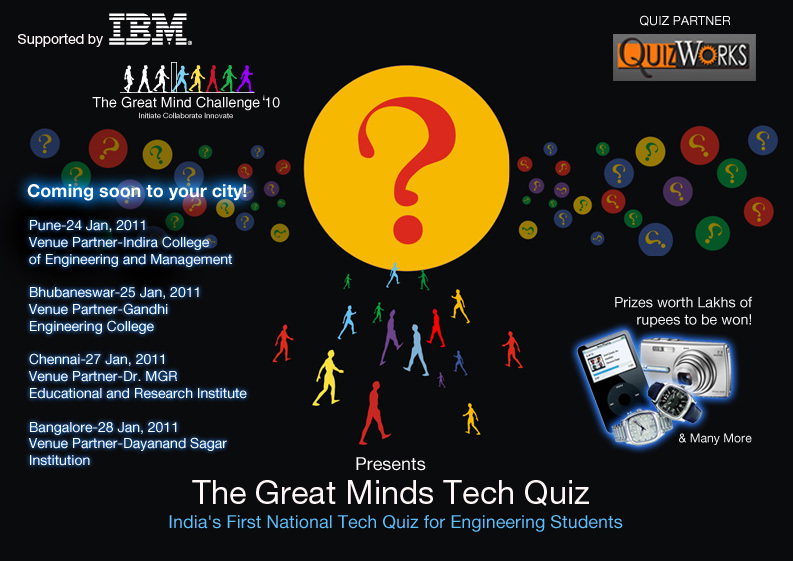 QuizWorks in partnership with IBM’s The Great Mind Challenge brings to you India’s first National Level Tech Quiz for Engineering Students – The Great Minds Tech Quiz. The first Edition of The Great Minds Tech Quiz saw an overwhelming response from the Engineering and MCA crowd across the country. With over 2000 students registering for the online quiz and over 300+ offline teams (teams of 3) participating across the four cities, the participation levels reiterated the grand success of the First ever National level tech quiz for Engineering Students. Find below the list of winners from across the country who will now battle it out in the National Finals in May. This is to announce the second edition of Mega-Whats, KQA’s National Open Quizzing Championship. The quiz will be held across nine cities simultaneously. Apart from Bangalore, we have venue confirmations from Chennai, Hyderabad, Goa, Thrissur, Mumbai, Pune, New Delhi and Kolkata. 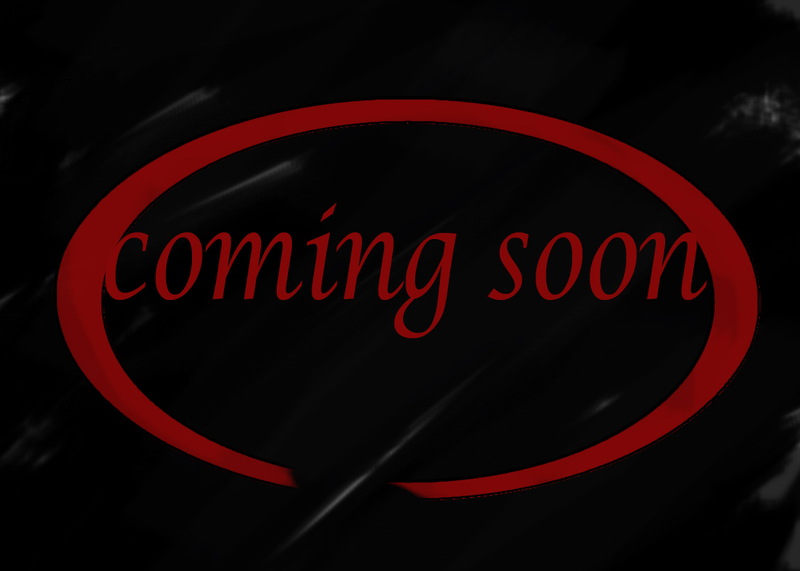 More information on venues soon. The venue in Bangalore is the first-floor hall at The Institute of Agricultural Technologists, Queen’s Road. Please register early–the hall can accommodate about 30 teams. 1. General quiz, open to all. 2. Teams of FOUR members (or less). 3. Prior registration is essential. 4. To register, please email Mahaquizzer@gmail.com with Mega-Whats 2010 and the city you are competing from in the subject-header. 6. Email registrations will close on Tuesday 7th December 2010. Centre coordinators will allow entries after the cut-off date at their discretion. 7. Please note that the quizzing community in your city may charge an entry fee to meet venue and equipment hire expenses. 8. The school category is open only to teams comprising students from Std. VIII-X . 9. School teams ( Std. VIII-X) are allowed free entry. A school may field ONE team. 10. Please report by 1430hrs at the venue in your city. Since we need to ensure a coordinated start nationwide, the quiz will start at 1500hrs sharp. The doors will be closed five minutes before we begin. 11. Contesting teams will answer in writing a quiz of six sections and about sixty questions, inclusive of audios, videos and visuals. 12. Answers and scores will be announced immediately after the event–prizes will be given out for Best School Team, Best College Team, and Best Open Team. 13. The prizes aren’t small–they are insignificant. 14. We will rank the top 100 teams across the country–this list will go up by the 25th of December. 15. The rankings will be announced after adjudication. The decision of the quiz-masters will be final and binding on all participants. 16. The city-winners will face off in June 2011 as part of the KQA 28th Anniversary. The annual intercollegiate Sweden-India Nobel Memorial Quiz 2010 which offers the winning team a chance to visit Sweden, will commence its qualifying rounds with Bengaluru on September 18, 2010. This will be followed by Mumbai (September 25) Pune (September 26), and Delhi (Oct 23). Qualifying teams from the four cities will compete against each other at the Grand Finalé which will be held on October 23, 2010 at IIT Delhi. B-Quizzed @ SIBM is a National Level Business Quiz Competition conceptualized by SIBM Pune, aimed at all MBA aspirants to give them an opportunity to test their business acumen and also provide them with a glimpse of the Business World. Events are frequently conducted by the B School students, for the B School students but this is the first time an event is being organized on a national scale for MBA aspirants. 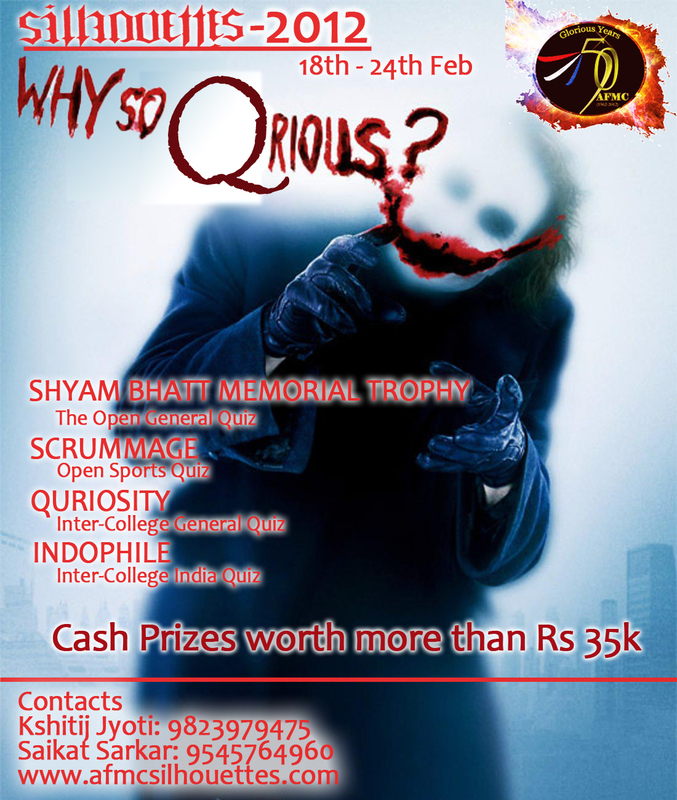 B-Quizzed @ SIBM is an event for students pursuing their undergraduate studies across the country. The event will be conducted under the auspices of the Aspirant Relations Team.